DIRECTIONS: Heading west from Chateaugay on Route 11, turn north onto County Routte 35 for 2.1 miles. Just past the Chateaugay Fish & Game Club, there will be a small dirt road on your left (northwest). 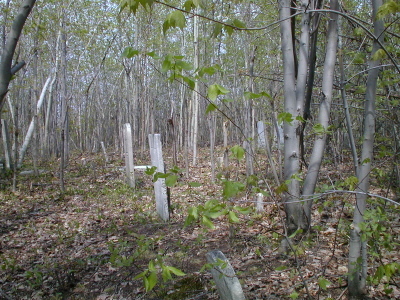 The cemetery is on a knoll on the east side of the dirt road. 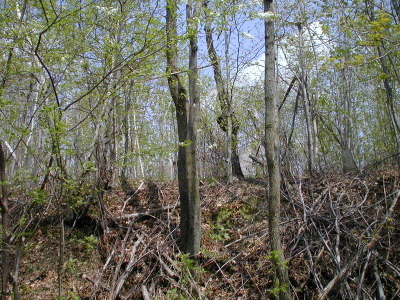 This cemetery is also known as Chasm Road Cemetery. The original transcription was completed by Hulda & C. W. McLellan July 16, 1949. He wrote "Surrounded by wire fence but very much overgrown. Many plain field stones." Additions in red were added by Phyllis Thompson in July 1994. 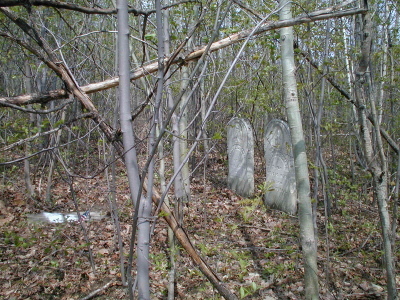 Photographs were taken of remaining stones on 3 May 2001 by Joyce M. Ranieri. This is all you can see from the dirt road. If you look carefully, you can see a few tombstones on the hill. This cemetery is extremely grown up and the stones are difficult to find. Sarah J. Died Nov. 11, 1847 AE 2 yrs. 3 mos. Daniel E. Died July 28, 1863 AE 4 y'rs 28 d's. Samuel PERCY Died Sept. 27, 1856 AE 78 yrs. & 2 mos. Laura Wife of Samuel PERCY Died April 20, 1862 AE 75 years 8 mos. Ephraim PERCY Died Dec. __, 1834 AE 80 y'rs. Garrett V. Son of G.V. & Eunice PERCY Died July 21, 1851 AE 19 yrs. Seprona Dau of G. V. & Eunice PERCY Died July 21, 1851 AE 21 yrs. Prepare to die and follow me. Mary A. dau of James & A. (H.?) C. REILLY Died Mar. 1, 1882 Aged 1 yr. 9 mos. Willie Son of Edward & Ester WHITE Died May 23, 1867 AE 4 yrs. 1 mo. Johnathan WOOD Died June 23, 1859 AE 71 Yrs. Elizabeth Wife of Johnathan WOOD Died Dec. 27, 1848 AE 42 Y'rs. **These stones were moved by the family to their lot in Sandy Knoll Cemetery.